A modern lightweight aluminium rollator. It stands up ready to use even when folded. The perching seat, net bag and stick holder are standard. 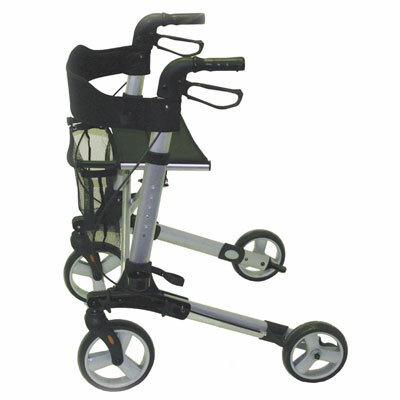 This is a modern lightweight rollator manufactured by Days Medical. Its clever design means that it can stand up ready to use even when it is folded, so that you do not need to reach down to set it up for use. The handle is height adjustable to suit the user, and it has ergonomic hand grips with lockable loop brake levers. An integrated seat with a cushioned safety bar back rest provide a comfortable perch for resting. Included accessories are a net bag for shopping and belongings and a walking stick holder.